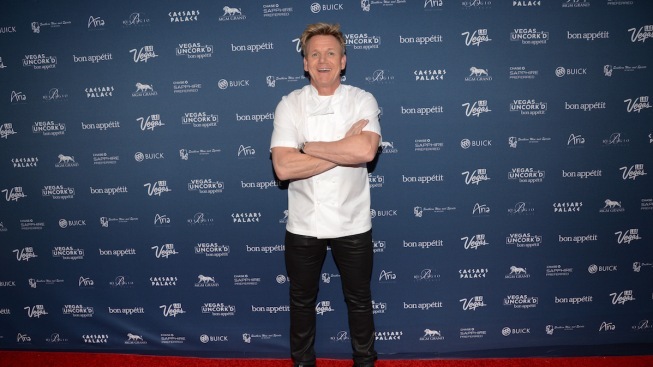 This April 24, 2015, file photo shows chef Gordon Ramsay in Las Vegas. Two patrons of chef Gordon Ramsay's newest restaurant on the Las Vegas Strip were taken to a hospital for treatment for injuries involving a drink. "The particular type of specialty drink served at Hell’s Kitchen is served at the finest restaurants worldwide without incident. But, out of an abundance of caution, Hell’s Kitchen has removed the drink item at issue from the menu" said a statement from Caesar's Palace. The company would not specify the drink. The Las Vegas Review-Journal reports it was a flaming tiki-style cocktail called Rum Donkey.